Caramel candy apples are a fall tradition, but you don't have to wait for chilly weather to enjoy them. Make your own, for your whole family to enjoy. Making a candy or caramel apple is simple enough to allow for unbridled creativity. 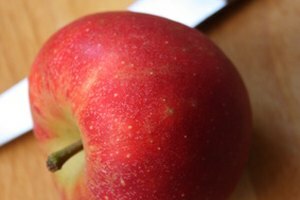 Choose firm, tart apples such as granny Smith or honey crisp. Be creative in your choice of toppings. Try sea salt with caramel, white and dark chocolate drizzles, chopped nuts and candies, or even a caramel apple with shredded sharp cheddar cheese. Set a baking sheet covered in parchment near your work area. If you plan to use toppings, portion them into individual bowls. Wash the apples in a mixture of water and white vinegar to remove the food-grade wax coating. Dry thoroughly. Firmly insert the tip of a wooden chopstick through the stem of each apple. Melt the caramel candies in a small saucepan over low heat, stirring frequently. Dip each apple in the melted caramel. Swirl to coat. If you do not want to use chocolate, dip the apple in your favorite toppings for a heavy coat. Sprinkle them over the apple for a lighter touch. Set the apple on a baking sheet covered in parchment to cool. Melt the chocolate if you're using it. Dip the cooled caramel-coated apple in the chocolate, or use a spoon to drizzle the melted chocolate over the apple. Set the finished apple on the baking sheet to cool until the chocolate is firm. If the apples you've chosen are moderately sized, you may be able to eat them whole. 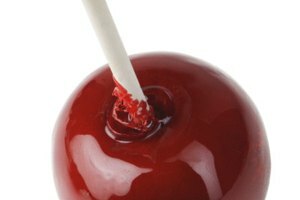 Use the chopstick as a handle and be prepared for bits of chocolate and toppings to fall off as you bite into the apple. Alternatively, you can slice the apple into eighths to make it more manageable -- and neater -- to eat. Set the apple, stick facing up, on a cutting board. Use the stick to hold the apple steady and as a cutting guide as you slice through the center. Cut each half into four pieces. Use a sharp chef's knife to slice the apple. Slice the apple just before you are ready to eat, otherwise the fruit will turn brown as it is exposed to air.